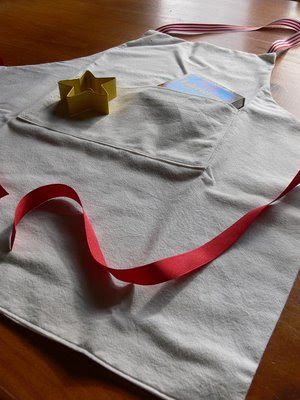 Audrey was invited to Max's fifth birthday party yesterday, so we whipped up a gift that we knew he'd like... An apron with fabric crayons so he can decorate it himself and a star cookie cutter. I've found that kids love things even more if they have some involvement in the final product. 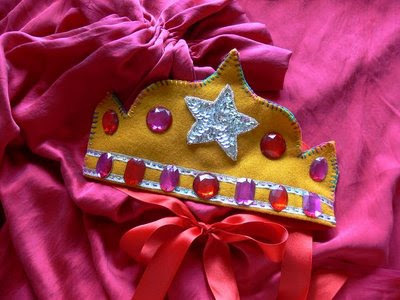 Way back in August we gave Audrey a kit of fabrics and jewels and things to make a cape and felt birthday crown (mostly because I ran out of time to make them, but partly because I wanted her to have some fun with it too...). We made the cape straight away and it has been well loved. Audrey drew a pattern for the shape of the crown and we started it, but didn't finish. What better reason to finish than a fancy dress birthday party?